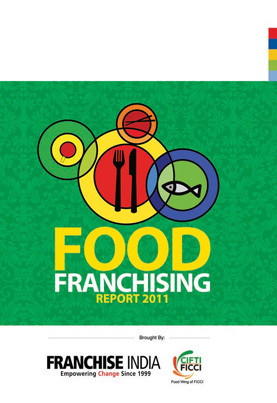 The Food Franchising Report 2011 is India's first exclusive Franchise report on the food industry brought out jointly by FICCI-CIFTI & Franchise India Holdings Ltd. The report highlights authentic facts about the Indian Food Franchising Market and showcases extensive know-how about the Indian Food Market, Food Franchising in India & the Indian Food and Beverage Suppliers. This report provides a strategic approach to the opportunities and challenges for growth through the franchise route in the food industry. A Must Buy Food Franchising Report 2011 gives a comprehensive learning curve for restaurant owners and existing food companies looking out to expand their brand across the country. The Report is a must buy for everyone who is in the food service industry or is planning to enter the food services sector through the franchise route. Master Franchisees of International Food Brands, Multi-unit and multi-concept franchisees in food service industry will find it useful to carry out their growth plans. International Food Brands looking to carve an India entry will find the report a functional guide towards building their growth strategy. Food Franchise Directory This rich content is further supplemented by a "best of" compilation food service franchise operators Directory .For entrepreneurs who are looking to enter or grow in the food service sector, the directory pages have it all, to seek out the franchise that's right for you or grow the business in the world of food outlets. The Directory will give a complete information on over 100 available food franchise systems in India. These pages cover franchise opportunities in bakery goods and pastry shops, candy and snack stores, coffee and espresso bars, full service franchise restaurants and bars, ice cream and frozen yogurt parlors, pizza restaurant franchises, quick service and take out venues, and sandwich shops. INDIA OVERVIEW India is a country of striking contrasts and enormous ethnic, linguistic and cultural diversity. It has a population of 1.21 billion with 28 states and seven Union Territories (under federal government rule). The states differ vastly in resources, culture, food habits, living standards and languages. Vast disparities in per-capita income levels exist between and within the states. About 75 per cent of the country's population lives in six lakh villages and the rest in 7,000 towns and cities. There are 27 cities with population above one million. Nearly, 48 per cent of Indians spend on food (54 per cent in rural areas and 41 per cent in urban areas); mostly on basic food items like grains, vegetable oils, sugar, vegetables, eggs, fruits etc. Religion has a major influence on eating habits and predominantly supports a vegetarian diet. Per capita expenditure on food consumption by people in rural areas is more than 10 per cent than people in urban parts. The figures on consumption pattern released by the National Sample Survey Office (NSSO) showed that over half of the expenditure by rural households went on food items during 2009-10. The figure for urban India was 40 per cent and the reason for high spending on food items was inflation, which touched 19 per cent during 2009 -10. The data also showed a difference in the consumption patterns of the rural and urban India. In urban parts, one has to spend a lot on rent and transport, which is not the case in rural areas. So, percentage of food expenditure in urban India was less. Per capita consumption expenditure in urban India stood at Rs 1,984.46 per month against Rs 1,053.64 in rural areas in 2009-10. Some observers are, however, highly optimistic about the consumption growth potential and believe that rising income levels, increasing urbanisation, a changing age profile (more young people), increasing consumerism, a significant rise in the number of single men and women professionals and availability of easy credit will push India onto a new growth trajectory. These segments of the population are aware of quality differences, insist on world standards and are willing to pay a premium for quality. Nonetheless, a major share of Indian consumers has to sacrifice quality for affordable prices. The Indian urban population is projected to increase from 28 per cent to 40 per cent of the total population by 2020 Presently, India is among the world's largest economies, following the globalisation and liberalisation that started about 18 years ago. The economy is growing in leaps and bounds and the Gross Domestic Product (GDP) was recorded at 9.8 per cent in 2006, 9.3 per cent in 2007, 7.8 per cent in 2008, 7.4 per cent in 2009 and 8.5 per cent in 2010-11 and it is expected to grow eight per cent in 2012. In the food and beverage market, for food companies, India's huge population of 1.21 billion consumers is the major attraction and the factors include rising per capita disposable income, large and growing middle class, increasing exposure to the West, a slow, but steady transformation of the retail food sector in cities, growing number of fast food chains, increasing urbanisation, growing number of working women, growing food processing industry looking for imported food ingredients, growing health awareness among the middle class and growing consumerism. Still, there are some major challenges before the country's Food and Beverage Industry due to divergent food habits, preference for fresh products and traditional foods, difficulties in accessing vast untapped rural markets, poor infrastructure, diverse agro-industrial base, offering products at competitive prices, high tariffs, out-dated food laws, and unscientific sanitary and phytosanitary restrictions and competition from other countries. Service sector playing major role The share of services in India's GDP at factor cost increased rapidly from 30.5 per cent in 1950-51 to 55.2 per cent in 2009-10. If construction is also included then the share increased to 63.4 per cent in 2009-10. These sectors directly and indirectly generate huge employment, resulting in increased income in the hands of the people and in turn increase in consumption. However, as the economy is relatively insulated from the global financial meltdown, India's growth remains on track from a long-term perspective. The growth in Indian economy, from 5.7 per cent in the 90s to 8.6 per cent during 2004-05 to 2009-10, was largely due to the acceleration of the growth rate, Compound Annual Growth Rate (CAGR), in the services sector from 7.5 per cent to 10.3 per cent. The service sector growth was significantly faster than 6.6 per cent for the combined agriculture and industry sectors. In 2009-10, services growth was 10.1 per cent and in 2010-11 (advance estimatesAE) it was 9.6 per cent. India's services GDP growth has been continuously above overall GDP growth. The services categories- trade, hotels, transport and communication, financing, insurance, real estate and business services have performed well with the growth of 11 per cent and 10.6 per cent, respectively in 2010-11 (AE). Only community, social and personal services have registered a low growth of 5.7 per cent due to base effect of fiscal stimulus in the previous years, thus contributing to the slight deceleration in the growth of the services sector. Agri-wise growth The growth rate in agriculture showed an upward trend in the third advanced estimate as compared to the second advanced estimate. Due to this upward trend in the production, the growth rate in agriculture, forestry and fishing sector in 2009-10 showed a growth rate of 0.2 per cent, as against the growth rate of (-) 0.2 per cent in the advance estimates. Mining and quarrying registered a growth rate of 9.7 per cent during 2009-10, as against the growth rate of 8.3 per cent during April-November, 2009, which was used in the advance estimate. Similarly, manufacturing registered a growth rate of 10.9 per cent during 2009-10, as against the growth rate of 7.7 per cent during April-November 2009. Due to this increase in the GDP, manufacturing sector is now estimated at 10.8 per cent, as against the advance estimate growth rate of 8.9 per cent. Inflation hurdle Economists forecast the growth in the financial year March 2012, will be 7.9 per cent, quite a drop from last year's 8.5, but they are also optimistic about the recovery to 8.4 per cent by March 2013, end. Inflation rate has reduced from double digit to single digit, which is a sign of relief. Increasing commodity prices, especially oil and food articles had fuelled inflation in India in recent times. As per government statistics, India's food price index stood at 7.33 per cent and the fuel price index reached 12.12 per cent in July, 2011. In the previous check, annual food and fuel inflation stood at 7.58 per cent and 11.89 per cent, respectively. Eating out in India Global slowdown has been fairy resilient on the F&B industry as compared to others. The industry is expected to grow further. With developing economy and large population with rising per capita income are propelling the growth. India and its eating habits are changing dramatically from eating at home to eating out. This transition phase is fuelled due to various economic reasons. The market (eating out) is driven by consumers eating at any form of outlet restaurants, fine dining, Quick Service Restaurants (QSRs), takeaways, 'dhabas' or any other form of unorganised eateries. Agri-wise growth The growth rate in agriculture showed an upward trend in the third advanced estimate as compared to the second advanced estimate. Due to this upward trend in the production, the growth rate in agriculture, forestry and fishing sector in 2009-10 showed a growth rate of 0.2 per cent, as against the growth rate of (-) 0.2 per cent in the advance estimates. Mining and quarrying registered a growth rate of 9.7 per cent during 2009-10, as against the growth rate of 8.3 per cent during April-November, 2009, which was used in the advance estimate. Similarly, manufacturing registered a growth rate of 10.9 per cent during 2009-10, as against the growth rate of 7.7 per cent during April-November 2009. Due to this increase in the GDP, manufacturing sector is now estimated at 10.8 per cent, as against the advance estimate growth rate of 8.9 per cent. Inflation hurdle Economists forecast the growth in the financial year March 2012, will be 7.9 per cent, quite a drop from last year's 8.5, but they are also optimistic about the recovery to 8.4 per cent by March 2013, end. Inflation rate has reduced from double digit to single digit, which is a sign of relief. Increasing commodity prices, especially oil and food articles had fuelled inflation in India in recent times. As per government statistics, India's food price index stood at 7.33 per cent and the fuel price index reached 12.12 per cent in July, 2011. In the previous check, annual food and fuel inflation stood at 7.58 per cent and 11.89 per cent, respectively. Eating out is closely associated with fun time. Almost 50 per cent of the Indians eat out on regular basis. Indians, on an average eat out 1.2 times a month, where as it is 40 times in Singapore. Even if the number goes up to four in India, this will generate the largest opportunity in the market. Seven per cent of the total restaurant market includes Quick Service Restaurants (QSR) and the restaurant industry is growing at 20-30 per cent. Foreign fast food companies are also aggressively increasing their presence. The industry growth is fuelled by a population of 300 million from the age group 13-24. The key consumption areas are clothing and accessories, food, entertainment and durables. Spending power of this segment ranges between Rs 3,000 and 40,000 per month. The size of the Indian restaurant sector is estimated to be USD six billion and is expected to grow to USD 10 billion by 2018, almost 80 per cent of the total restaurant industry is unorganised. Despite the economic slowdown, the unorganised share is estimated to witness five per cent growth, whereas 20-25 per cent growth is estimated in the organised sector. Plastic money fuelling growth Modern formats such as malls, multiplexes and food courts have favoured the growth in F&B sector, as for majority of the population this is their favourite time pass, capitalising this has improved the performance many folds. Rising per capita income and tier-II and III cities promising growth has maneuvered restaurant owners to tap the left out markets. Increasing base of credit/debit card holders is also fuelling growth in eating out market. It is estimated that 25 million people were using cards for money transactions in 2008 and the growth is poised 20-25 per cent year-on-year. Travel, hotel and dining category accounts for 35 per cent of credit card usage. Future perfect! India has the potential to be a huge market and long-term opportunities for retailers are immense. According to Mc Kinsey Global Institute (MGI), India is likely to quadruple its consumption and be the fifth largest consumer by market size, continuing economic growth by 2025. A consumer confidence survey by Nielson ranked India as one of the fastest growing markets in the world and the current consumer belief that recession would soon be a thing of the past has fuelled Indians with confidence. According to the recent reports, the Indian consumer sector is attracting more interest from both private equity (PE), mergers and acquisitions. Fragmented nature of the retail sector and liberalisation of the economy indicates that the market will be increasingly attractive to foreign food giants. India's food service entrepreneurs are executing massive expansion plans with the industry expected to grow 48 per cent to USD 667.49 million in the next two years. A number of food service players from overseas have already signaled their intent to enter India and many more are likely to follow the suit.